= Do you want to go on a date with me today? 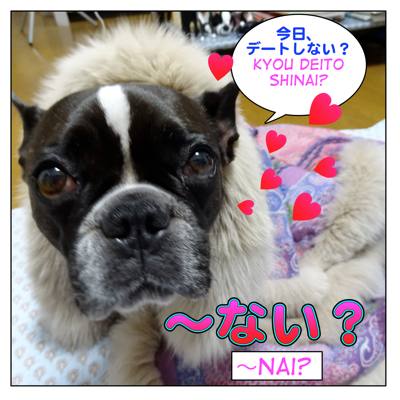 As you know ない ( = nai) is a negative form but you can use it when you suggest doing something to someone with you or encourage someone to do something with ない ( = nai)? You can also make a tag question with it. Now let’s add a question mark,？. Note: Stress the last verb with rising intonation when you read it. = Toukyou ni ikimasen ka? = Would you like to go to Tokyo with me? Note 1) Be careful with か ( = ka). A lot of people add “か ( = ka)” automatically when they make a question. This is male speech and sounds rough. Note 2 ) If you add の ( = no) after ない ( = nai) you can express a feeling of surprise. = Don’t you go to Tokyo? = Toukyou ni ikanai no desu ka? Asking someone to do something together or encouraging someone to do something. = Issho ni ohiru tabenai? = Ashita, eiga demo mini ikanai? = Do you like to go see a movie or something tomorrow? = Natsuyasumi, watashi to nyuuyooku ni ikanai? = Would you like to go to N.Y. with me over the summer vacation? = Nihongo wo benkyou shite minai? = Would you like to give studying Japanese a try? = Issho ni ocha demo nomanai? = Would you like to have a cup of tea (or coffee) with me? = Kenichi kun mo nihongo nouryoku shiken wo ukete minai? = Do you also want to try to take the JLPT test, Kenichi? Also you use 「~ない ( = nai)?」 for a tag question. Expressing your opinion/feelings and ask your listener’s agreement. You can also use a negative form of adjectives or nouns. = Kono kyoku wo kiku to genki ga denai? = Ano sensei no jugyou, nemuku naranai? = Don’t you get tired trying (working) so hard? = Maggie Sensei tte kireijanai? = Isn’t that (dog over there) Maggie Sensei’s boyfriend? =Deito ni sasotta noni kotowararechatta. = I asked him out for a date but he turned me down. = Sekkaku oshare shita noni naa. = Oh well, I dressed up for nothing. = Dare ka issho ni asobanai? = Does anybody want to go out with me? Hello 先生! Could you help me with the following sentence (from my textbook)? To me, it seems like an imperative: “Don’t stare!” Am I correct? Also, is this female speech? Thanks! That’s の has a function of emphasis and this form is often used when teachers or parents tell small children to do/not to do something as an imperative form. It is possible for men (teacher/father) to use this form but you are right, women tend to use it more than men. FYI, you also use の at the end of the sentence to make your point. Isn’t it “neru” and “nenai” ? Just wondering, is there any difference between 見に行く and 観に行く ? I’ve always learnt to write it like the first one, so I was a bit surprised ! Thank you for what you do, I love your lessons, there’re really great ! But we use 観る for movies, musicals, arts, plays, arts, something you appreciate, sightseeing, etc.